Many large office buildings will have a receptionist near the entrance to let visitors know where to go. But, what do you do if you are in a smaller office building where it simply is not financially feasible to have a receptionist? In this case, tenant lobby signs are a must. NuView IRA realized this, so they contacted the friendly experts at Citrus Sign Studio for changeable tenant lobby signs for Longwood, FL. Located on South Ronald Reagan Boulevard in Longwood, NuView IRA is a self-directed individual retirement account (IRA) that specializes in giving their account holders the broadest possible investment options. They offer a wide range of investment types, including precious metals, tax deeds and liens, real estate, private companies, mortgages and notes, and much more. Their core values include serving others, passion, accountability, and integrity. When a business that does so much to help people with their investments came to us for custom lobby signs for Longwood, FL, we jumped at the chance to help out. 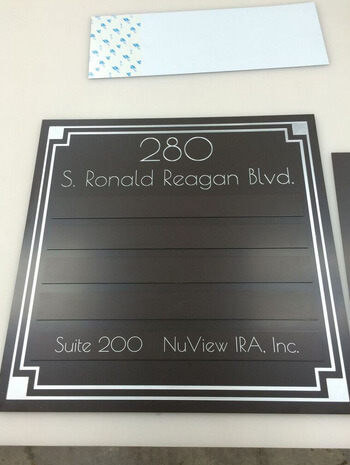 NuView IRA had recently built out a new office in a newer building, and they needed a way to let clients know where they were located. We knew just what to do. During an initial consultation, we learned that NuView had a very cost conscious budget. They also wanted something that looked like it was made of bronze metal and that had an art deco design flare to it. Based on their budget and vision, we came up with some design options for them to choose from. NuView IRA went with an excellent, affordable solution that consisted of a CNC-routed acrylic sign panel that was custom coat painted to a Duranodic bronze color. For the lettering, we used brushed silver. 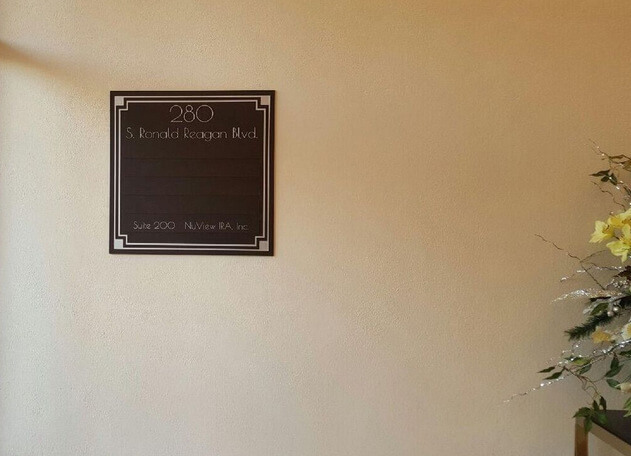 As new tenants move in and out of the building, it will be easy to change the names on the signs using the replaceable name plaques we provide. In the end, the client was completely satisfied with the work we did. Nothing turns off future tenants to your building quite like making it hard for guests to find different suites. Sure, businesses within the venue can give their customers detailed directions, but nothing beats having quality signage in place as visitors enter. Lobby signs come in many different sizes, shapes, materials, colors, and styles. Bronze and other metallic markers are ideal for financial companies like NuView because it projects an image of professionalism and stability. Also, as with NuView, you do not have to spend an arm and a leg on an all-metal sign to get the metal look. We can add paints or laminates to give you the same appearance at a fraction of the cost of a solid metal sign. Acrylic, PVC, vinyl, and sign foam are also popular reception area sign materials. If you interested in learning about what signage solutions would be best for your enterprise, contact Citrus Sign Studio today for a free consultation and quote on lobby signs.